Protective and regenerating cream designed to take care of the skin of the hands, based on shea butter, calendula and jojoba oils, enriched with hemp oil. Ideal for all skin types. 100ml. 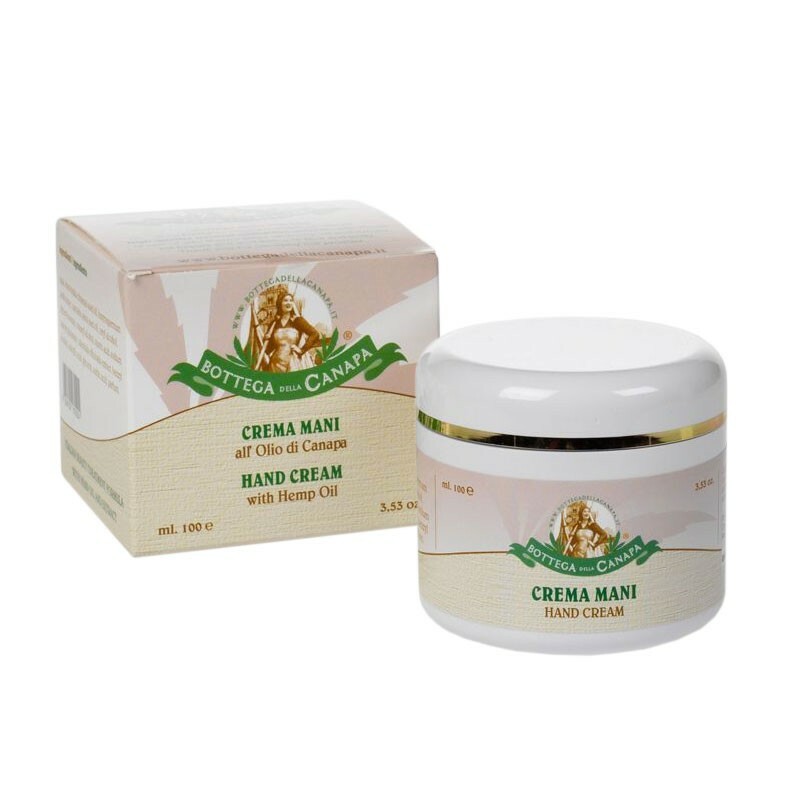 Protective and regenerating cream designed to take care of the skin of the hands, based on shea butter, calendula and jojoba oils, enriched with hemp oil. Light and delicate, it has both protective and restorative action, not greasy, penetrates deeply leaving the skin soft, velvety and elastic. Helps to restore the normal pH of the epidermis and its natural lipid protection deteriorated above all by the use of common detergents. Thanks to its very high content of active ingredients it has anti-aging action and prevents discolouring. Suitable for any age. Daily use is recommended. Apply on hands as needed. AQUA, SIMMONDSIA CHINENSIS SEED OIL, BUTYROSPERMUM PARKII SEED BUTTER, CANNABIS SATIVA SEED OIL, CETYL ALCOHOL, GLYCERYL STEARATE, CETEARYL ALCOHOL, STEARIC ACID, SODIUM LAUROYL GLUTAMATE, CALENDULA OFFICINALIS (flower) EXTRACT, BENZYL ALCOHOL, SALICYLIC ACID, GLYCERIN, SORBIC ACID, PARFUM. BOTTEGA DELLA CANAPA® NATURAL COSMETICS LINE.